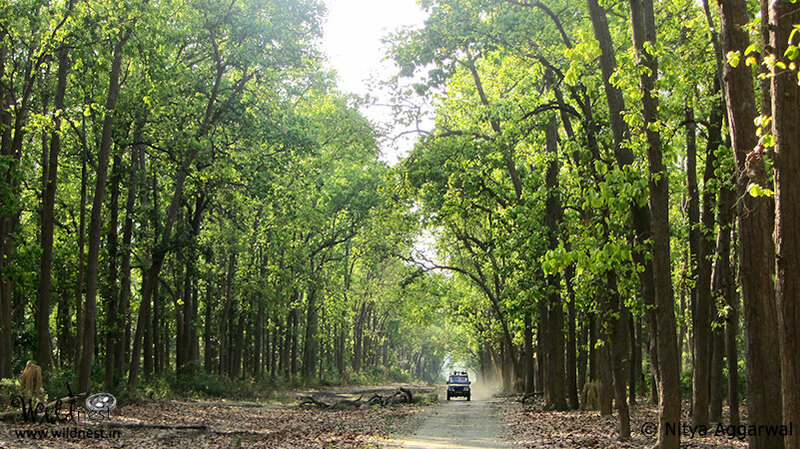 Corbett National Park is rightly given the title of “Jewel in the Crown”. Located in the foothills of Himalayas, it plays host to a massive no of tourists, be it nature lovers, photographers, family vacationers and school children. 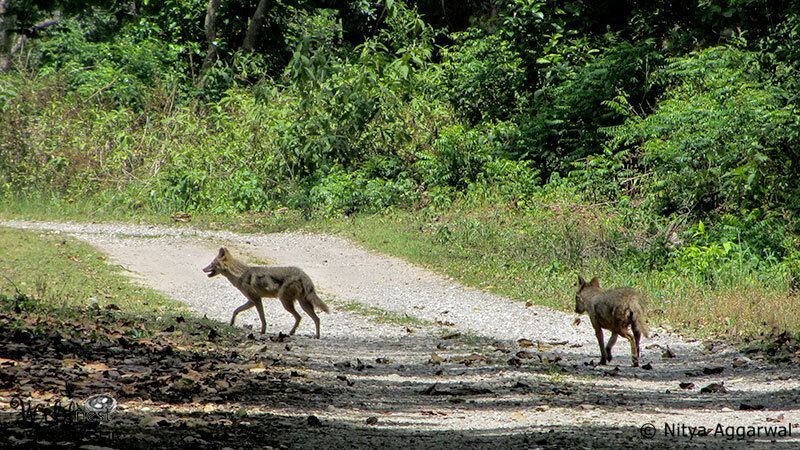 Although I had visited Corbett before, this visit was rather special as it was after six long years since my last one. Beautiful memories of Dhikala were still fresh in my mind. 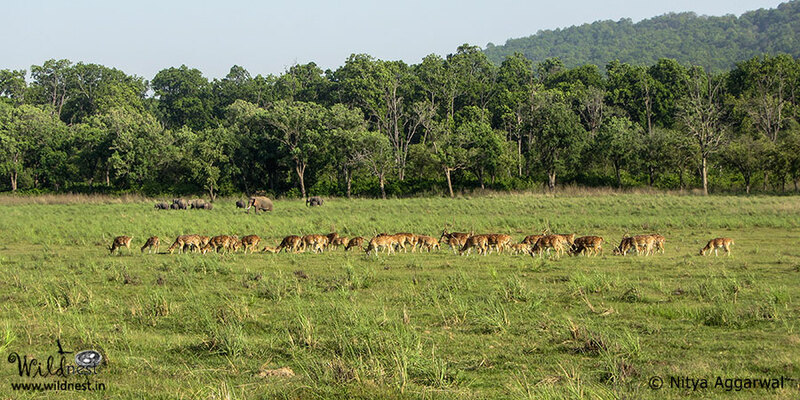 The first visit to Dhikala reminded me of the grasslands of Africa that we often see in wildlife channels. 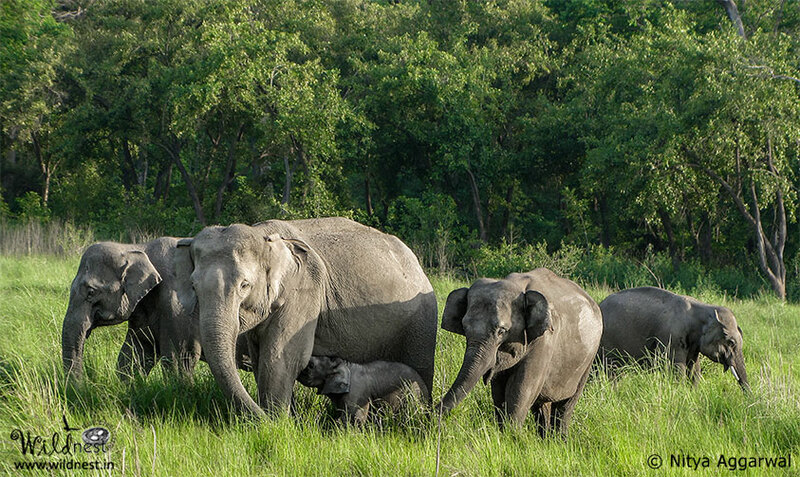 I was especially looking forward to visiting Corbett during the summer month of May,since it offers spell-bounding sighting of elephants. 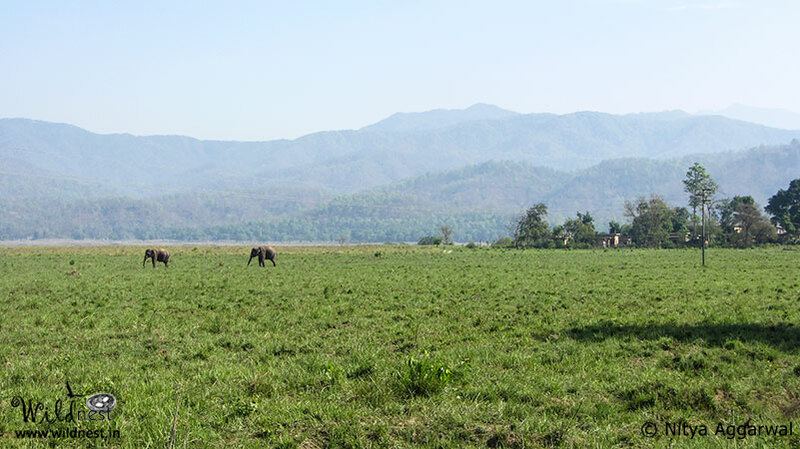 This time we made a trip for three days, out of which we spent two days in Dhikhala guest house and one night in Ramnagar for a safari in the Bijrani region. After an early start at 5:30 am, a 5-hour drive from Delhi to Ramnagar and another two hours from Dhangari gate to Dhikala, we reached at 1:00 in the afternoon at our destination. We(Myself, my mom and my three year old son) decided to miss the evening safari after a tiring journey (And undeniably we had already done a safari by going from Dhangari to Dhikala through the forest) though my father and another friend, who had accompanied us, carried on and came back after an amazing time spent observing elephants near the reservoir, cooling themselves in the water. Now we were charged up ready to go for next day safari.We slept peacefully that night in the lap of nature, fresh air having a healing and energizing effect on us. Its 5:00 am the next day and my little one is the first to get up all ready and excited for a safari. This was not his first time. He had already visited 6 national parks and seen tigers, lions, sloth bear, elephants and many other animals and birds in the wild. He is the youngest member in the family to join the “Wildlifers squad” and enjoys it thoroughly. 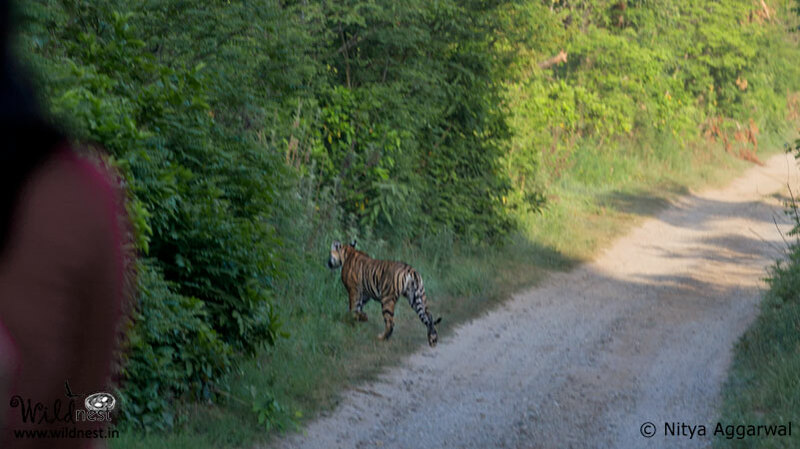 We took a chance for a tiger family sighting at “Thandi Sadak” where frequent sightings were reported.Also, earlier in the morning we had heard an alarm call in our guesthouse coming from this area.Our patience did not go in vain. After waiting patiently for about an hour, we were greeted with two tiger cubs,both aged about a year and half. First one ran so fast that hardly anyone noticed it, followed by the second who gracefully crossed the road giving everyone a chance to capture it with their camera. There were two more tigers still hiding in the grasses. Everyone was waiting for them to show themselves. Another hour had passed and we were sitting amidst the beautiful music of the jungle, enjoying the melodies of numerous birds that were going about their morning activities, keeping us busy with their little shows while we all were waiting for the big game. It was fun.We cherished each and every moment admiring the beauty of small birds like Orange Headed Thrush, Drongo, Golden Oriole and many more. On top of that we already had a good sighting of the majestic tiger. We moved ahead. A Tusker was enjoying his meal of tall elephant grass on the roadside, giving photographers a great time. Best was yet to come. 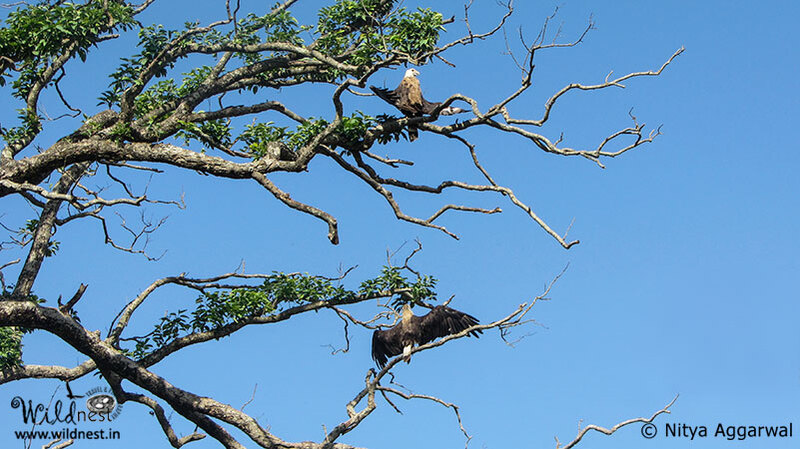 We saw two Pallas’s Fish Eagles perched on a tree from fairly close distance. This is the first time I ever saw them. During our stay of half an hour in that location they gave us all the possible poses except for flying ones. For the evening Safari, our driver decided to take us for a trip in another area of the park. It required us to cross the wooden bridge over Ramganga River (this bridge which was shown in the movie Kaal). What a sight!My son had a blast. We also invented a new game of counting the anthills on the jungle roads(good way to keep the young lads busy), which he thoroughly loved during all the safaris. Herds of spotted deer greeted us occasionally. As we were approaching a site where a Spot Bellied Owl was frequently sighted during that period, we entered a canopy of tall Sal trees (green tunnel of trees as called by Ayaan, my son) and hundreds of butterflies welcomed us by fluttering all around our gypsy. We tried stopping our vehicle and capturing that moment with our video camera. But as soon as we stopped they too settled down. Words can’t do justice to that awe-inspiring moment. We didn’t want to leave that place but decided against it to explore what was ahead. We decided to go to the reservoir now where we expected a big group of elephants playing in the water. As we reached, we saw two separate herds along with few deer in the grass. We started observing one herd and parked our car at a safe distance. After spending some fifteen minutes watching them, we saw few elephants from the other herd moving towards water. We decided to go to them. 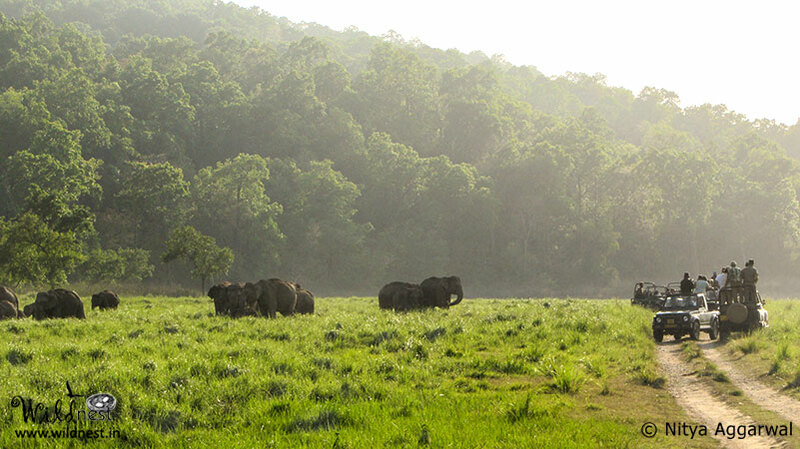 It was a huge herd of around 20- 25 elephants with around ten to fifteen females and remaining babies. (Males also known as tuskers leave the herd at the age of around 10 years). It was a wonderful sight observing them eating the grass. A simple task of eating too when observed carefully revealed us the various techniques such as how they pull the grass from the soil using their trunks, then remove the dust by tapping their foot, and finally eating it. As mothers were busy having their meal, the little ones too were busy suckling milk. Its amazing to see the kind of protection they get as many of them were hidden so beautifully under the elders that it was almost impossible to see them. An hour had passed, and soon the sun was about to set, when a gigantic tusker appeared from nowhere and started coming towards the herd. It approached the female closest to him first and went near her tail and raised its trunk as if wanted to smell something. He followed this behavior with all the females in the herd one after another. All of us who were simply relaxing and observing were now all geared up and excited to see such a unique display of behavior. The tusker was actually going near each female to check if she is in her heat period. This behavior is shown during the mating time. Presence of such a huge tusker in the middle disturbed the herd and we heard a loud grunt. All the babies were now seen more close to each other surrounded by the females all around. They started making all kind of sounds to let the tusker know that he is not welcome in the group. The sun soon disappeared and the deep forest melted into darkness. Leaving this beautiful setup with a heavy heart we returned to our abode. 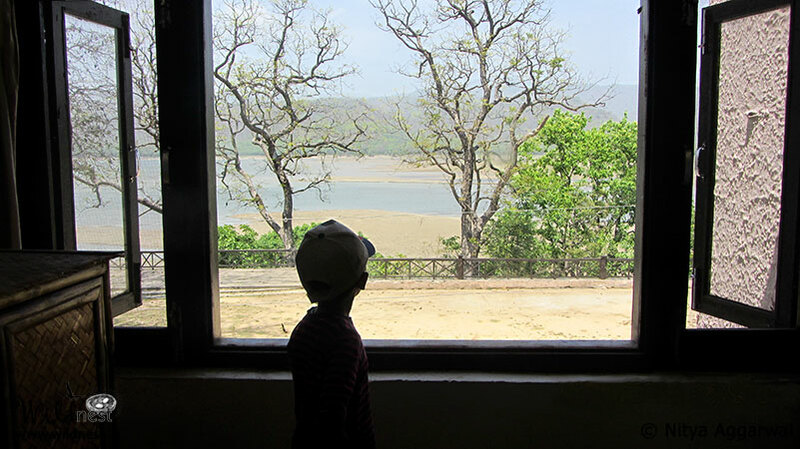 On Day 3 we left Dhikhala, for our resort in Ramnagar, after another exciting morning safari. En-route we decided to visit Geral, another guesthouse in the jungle.We came across predatory birds like Serpent Eagle and Brown Fish Owl. After reaching the resort in Ramnagar, we freshened up and had lunch. We were soon ready for an evening safari in the Bijrani area. Dotted with different landscape, there are few open areas in this region. We checked all the water holes where there was tiger movement a day before, but no luck. The tiger family had decided to stay in the hiding today. Anyways we moved on, trying our luck for other interesting things and came across the Great Hornbill, a large bird, also a specialty of Corbett. Ahead was a small herd of elephants. After enjoying the last safari of our trip, we came back looking forward for a visit to another wildlife park soon. 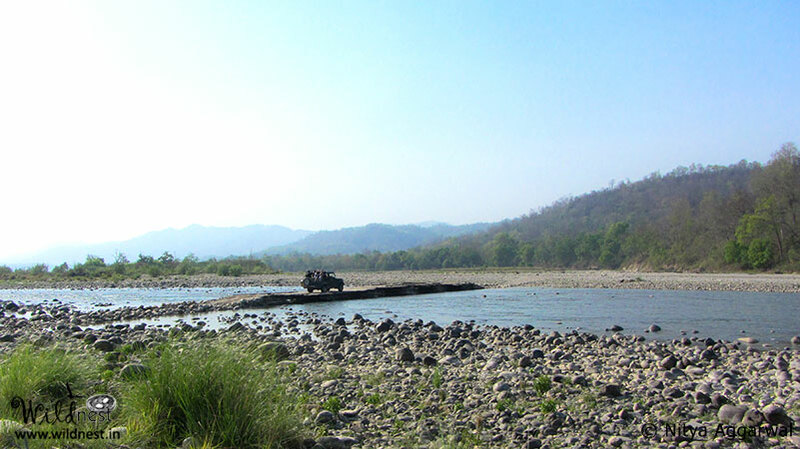 Planning your next holiday in Jim Corbett National Park? Click here to know more about it. 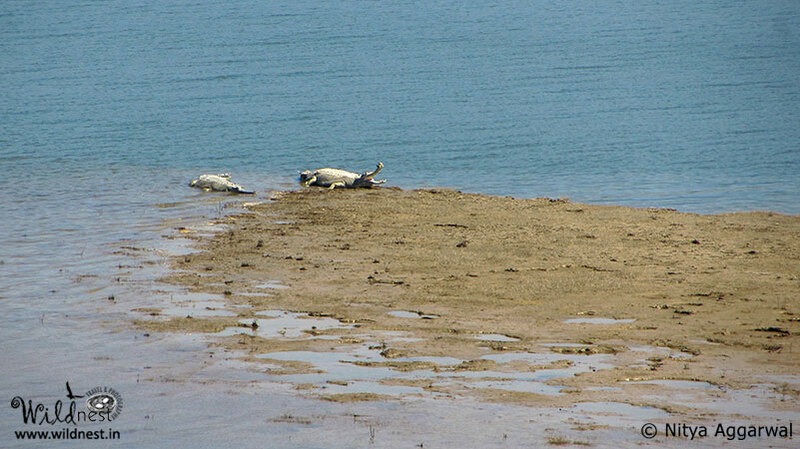 You can mail us at tour@wildnest.in or call us at 91-9999 5353 50 for any information regarding Wildlife of India.